Terraforming is the concept of altering the environment of a planetary surface to make it suitable for (terrestrial) life. The scientific literature about terraforming tends to be sparse, not to mention scattered over a number of journals and books. This book, by British planetologist Martyn Fogg, is an exhaustive book-length review of the scientific literature on terraforming, written at a level that's accessible to the casual (but scientifically-literate) reader. His references are quite thorough, and he is quite meticulous to credit the originator of each idea he mentions, so if you need more, you know where to go to look it up. It's published, oddly enough, by the Society of Automotive Engineers. Why the SAE? In explanation, Martyn says, SAE considers themselves to be first and foremost an engineering organization, and terraforming - planetary engineering - is engineering on the largest scale. Martyn Fogg is a regular writer of "science fact" articles for Analog, and the book reads quite smoothly. Note that these beat by over a decade the first scientific discussions of terraforming, Sagan's proposal to terraform Venus in 1961, and the proposals to terraform Mars by Burns and Harwit, and (independently) Sagan, in 1973. From here, he starts out with a review of how the ecology on a planet works, paying particular attention to how carbon, nitrogen, oxygen, phosphorus, and energy cycle through the system; emphasizing that we are the beneficiaries of a huge "gratis" energy flow provided by the sun and by the Earth's tectonic activity, that keeps the environmental cycles working and acts as an invisible "subsidy" to the human occupation of the Earth. Finally, 200 pages into the book, he discusses terraforming other planets. He starts with Mars, discussing the early (1973) models of Mars that suggested that, since Mars was once apparently warmer and wetter than it is now, a small "push" in the right direction might "snap" Mars into an alternative, warmer equilibrium due to a runaway greenhouse effect. To his credit, after a long discussion of the possibility of "gentle" terraforming of Mars, he then discusses the very likely case that Mars is not in a such metastable state, and discusses "hard" terraforming, with a wide analysis of techniques such as nuclear mining, cometary impact, importing volatiles from icy moons, and enhancing solar radiation. He closes with an example terraforming scenario using all the tools available. Of particular interest is his analysis of time scales. A long term project indeed! In the following chapter he discusses the much more difficult problem of terraforming Venus. His discussion of Venus gives an excellent historical background. When Sagan first proposed terraforming Venus by "seeding" algae into the clouds in 1961, Venus was though to be much more Earthlike than it is now known to be. We now know that the temperature of Venus is significantly hotter, the atmospheric pressure tremendously higher, and the chemical environment a lot harsher, than was thought in the pre-Pioneer days. Venus has just too damn much atmosphere. He also points out that, even if it were possible to engineer organisms to sequester the carbon dioxide from the Venus atmosphere, the process would take between eleven thousand and 1.1 million years, depending on how optimistic one is about how efficient photosynthesis could be made to become. Nevertheless, many science journalists (e.g., Adrian Berry) have continued to plug the "easy" terraforming of Venus by "just dropping a handful of algae into the atmosphere", and Fogg rather thoroughly debunks their optimism. Terraforming Venus is hard. His discussion covers most of the possibilities for dealing with atmosphere of Venus, ranging from ablating it away with myriad asteroidal impacts, to freezing it out with solar shields. The penultimate chapter is on fringe concepts and ultimate possibilities. He counts terraforming the moon and the larger satellites of the outer planets under fringe concepts, although in many ways these would be considerably easier than some of the other things he discusses. He then briefly discusses ever further out ideas, including moving planets, turning Jupiter into a star, and even the possibility of moving stars. OK. Now to be critical. 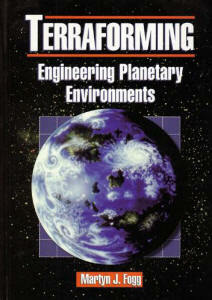 The book is billed as the first textbook on the subject of terraforming. I wouldn't call it a textbook; it reviews the subject, but doesn't attempt to teach the reader the techniques of analysis. In other words, having read the book the readers will be familiar with what has been calculated by others, but will not have the calculational tools to analyze terraforming calculations themselves. In particular, I found the discussion of the greenhouse effect, critical to an understanding of methods to warm Mars, to be superficial, barely more thorough than what you might find in the newspaper. There was no description of methods used to calculate the amount of greenhouse warming. A description of the greenhouse effect ought to include spectra, show a formula for integrating over the spectrum to compute total heat balance, and discuss the effect of optical depth. The book does not do this, and in fact never even gives a simplified model to calculate the amount of greenhouse warming. He does, however, include a useful empirical equation (unfortunately applicable only to Mars), to calculate the combined effect of water and CO2 greenhouse effect on overall surface temperature. The book suffers a bit from the fact that the illustrations are a hodgepodge collection of pictures from various articles, with nomenclature and units inconsistent from one to another. He skims over the discussion of nitrogen. He claims that an oxygen atmosphere, even at a few PSI (say, 3 PSI) partial pressure, requires a nitrogen "buffer" to prevent a fire hazard. His single reference for this statement, though, is a rather dubious one. While he does note that this is "a disputed figure," after this one note he takes the requirement for 75% of any atmosphere to be nitrogen as a canonical fact. This is a pity, since it allows him to avoid asking the tricky question of how little atmospheric nitrogen an ecosystem actually requires. Nitrogen is a tough problem for Mars, which is nearly absent of N, as far as we can tell from all the information we have at the present. Fogg postulates huge reserves in the form of of nitrate deposits, but I must point out that there is as yet no real evidence for such deposits, and it is quite possible that nitrogen on Mars is simply not there. He has a chapter on planetary engineering of the Earth, which talks about reversing greenhouse warming by a sun-shield. He doesn't note that reducing sunlight would also reduce photosynthesis, and hence enhance the greenhouse effect. (This could, of course, be ameliorated by a dichroic shield, which selectively passes the wavelengths most useful for photosynthesis). I would have liked the flow better if he had put re-engineering Earth last, with the emphasis that we need to study, understand, and experiment, and make our mistakes on other planets first before embarking to mess with the one we live on. He could have emphasized how we understand greenhouse effect based on our studies of Venus; how the "nuclear winter" scenario was proposed based on studies of the effects of global dust coverage of Mars. A small thing that bothered me was that he doesn't very well distinguish between realistic and far-out ideas. One of the proposals he discusses, for example, was to increase the spin of Venus using three quadrillion objects circulating between Venus and the sun every 2 hours, each traveling at 10% of the speed of light. I would personally have put that into the "fringe concepts" section, myself. However, that's only a minor quibble. Fogg uses the "fringe concepts" pigeonhole to discuss the really far-out concepts.